Since 1937, car guys and gals have bought from, trusted, and shouted from the rooftops all about EATON Detroit Spring. Our springs will fit your vehicle perfectly. If you give us accurate information and install your springs correctly, you will never have a problem with our springs. Our experts are always willing to help. Have a question, don’t know what to get, or just want to order from somebody who knows what they’re talking about? That’s what we specialize in. If you want to know what realizing the American dream really looks like, read on. The year is 1937 and we’re in the middle of the Great Depression. The banks have failed, throwing people out of their homes and into crowded and insufficient bread lines. Most of the country is stalled in fear, but Frank and Grace Eaton only see opportunity, so they sell everything they have left and buy the aftermarket division of Detroit Steel Products for $11,000. With this risk, they started building their personal empire and picked themselves to win when others were too afraid to play. A few years after the purchase, Frank and Grace were told their lease would not be renewed. So they picked up everything and moved, lock stock and barrel, to the corner of Michigan and Trumbull. You might recognize that as the former home of Tiger Stadium. It’s also where we’re still located. Many years have gone by and we still use the plant to produce springs, giving us the experience and time required to become the leading manufacturer of leaf and coil springs for the restoration and street rod markets. We’ve accrued over 24,000 Original Equipment Spring Blueprints over the years, giving us the leading edge in leaf spring design and manufacture over everybody else in the industry. Mike runs the company now, along with his daughter Kim, the grandson and great-granddaughter of Frank and Grace. 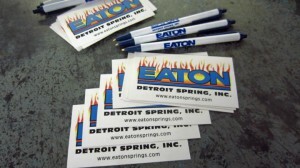 Send Kim an email at kim@eatonsprings.com with all the below information and we’ll send you EATON Detroit Spring pens and stickers free of charge!